Related information about the additional material for the MTH Pro app. The volumes in the Mapping Tonal Harmony Workbooks collection have been envisioned as auxiliary material in the study of Tonal Harmony. The main objective of these books is to provide the student, teachers, composers and/or songwriters with a tool that will aid them in hearing, analyzing, foreseeing, and composing harmonic progressions without struggle, in all keys alike. 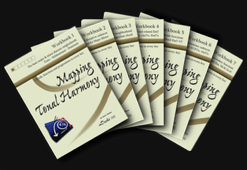 These workbooks are based on the map used in the Mapping Tonal Harmony Pro app by mDecks Music, which is recommended as accompanying material/tool for all volumes. All maps, progression examples and exercises in these books, were designed to improve and expand the student’s view of the harmonic surroundings around each and every tonal center. The following four pages show different types of worksheets included in the workbooks and their related tasks. 1) Writing the suggested progressions in the current key. 2) Level 1 Map in the key of Eb Major. What is in these workbooks? the known area around the tonic. The volume number for each workbook corresponds to a level in the Mapping Tonal Harmony Pro app. 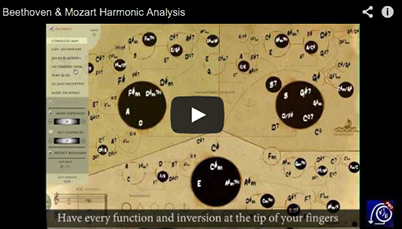 map essential harmonic functions in every key. The workbooks are structured, and expected to be used, in the same manner. How do I study with these workbooks? tonic and other known functions also check for standard resolution paths to and from them. 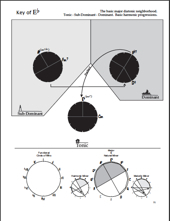 the supporting "Mapping Tonal Harmony" application provided by mDecks. least one of the new functions in each. recognize and write music using these functions has sufficiently improved in all keys. Is it necessary to purchase all workbooks in order? No. Each volume is self contained. The introductory chapters are included in every volume. You can decide which volume is the right one for your level by looking at the list of functions introduced in each workbook. Just keep in mind that the map's complexity increases by volume and you need to know all previously used functions in order to map/study the new ones for the selected volume. Why is the functional notation using m for minor chords instead of lower case roman numerals? 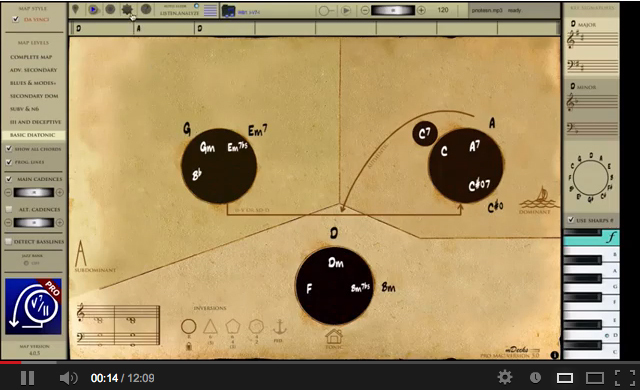 Why are there two maps for enharmonic keys? Since the main objective of these workbooks is to learn and map all functions in every key, maps for both sharp and flat keys have been included. Why is Workbook 1 more expensive than the rest of the volumes? 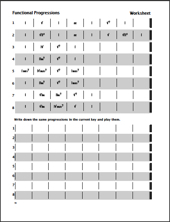 Workbook 1 is double the size in pages since it introduces the basic diatonic neighborhood for both major and minor independently. The rest of the workbooks treat functions from both major and minor keys simultaneously. Why are the books not available as pdf downloads? Most of the pages in these workbooks are fill-in-the-blanks worksheets and staff paper to write progressions on. It would not make much sense to have them in pdf format, even if free, since the printing cost for 100+ pages would be very high. I have noticed some differences between the map on Mapping Tonal Harmony Pro app and the one in the workbooks. Why is that? There are a few differences between them but they are essentially the same map. A few functions have been relocated to adjust spacing issues in the app. The map in the Mapping Tonal Harmony Pro app is created in real-time and it has also been "evolving" since its first version. As an example: The map in the app now shows all functions in standard classical chord notation with inversions an pedal points, as well as Jazz chords with tensions. In the workbooks, the chord notation has been somewhat modified from the standard to allow the use of tension numbers to accommodate a more contemporary interpretation of functions. 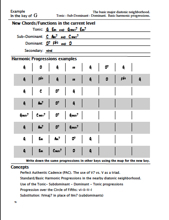 Workbook 1: Basic Diatonic Neighborhood. Workbook 7: The entire MAP, including all secondary functions. Mapping all secondary subVs/x and their related IIm. The N6 and Gr+6.